Camargue bulls roam through the field in the Plaine de la Camargue in the Provence, France. In the Provence, France you will find a specialized breed of Camargue bulls that roam freely through the fields in Parc Naturel Regional de Camargue. These bulls are a fair bit smaller than modern bulls and are typically raised for their distinctive meat which is served in local dishes and stews. The Camargue bulls in the Provence, France are also used in a form of bull running which dates back to the sixteenth century. Men try to pick a cockade that is fixed between the horns of a running bull. The Camargue in the Provence, France is a river delta where the Rhone meets the Mediterranean Sea and covers approximately 360 square miles. The Camargue is home to unique breeds of bulls, horses, sheep, wild boars, beavers, badgers, frogs, water snakes, turtles and more than 400 species of birds including that of the pink flamingo. 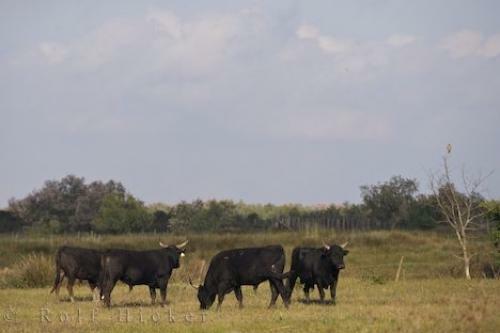 Photo of Camargue Bulls in Parc Naturel Regional de Camargue in the Provence, France. Camargue Bulls on Plaine de la Camargue, Parc Naturel Regional de Camargue, Camargue, Bouches du Rhone, Provence, France, Europe. I photographed this photo with the digital SLR camera model Canon EOS-1Ds Mark II, aperture of f/6.3, exposure time of 1/320 sec. on ISO 100, as always I used a original Canon Lens, the focus lenght for this picture was 275mm.